Welcome to Saint Dominic’s Parish Church for the Sunday Holy Mass celebration. As we listen to the Word of God on this thirteenth Sunday in the Liturgical Year B, we get the very important message that the Lord Our God is the Source and the Giver of life. Suffering and death are not included in the creation package of man but rather the evil consequences of sin. 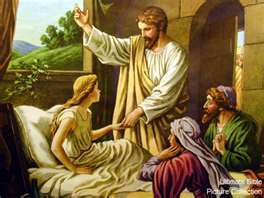 God’s healing and life restoring power, therefore, has been manifested yesterday in the mission of Jesus Christ and today in that of the Church. Let us pray hard in this Holy Mass for both blessings: the healing of our wounded nature and the new life of our humanity. No stronger evidence could be ever found in Sacred Scriptures than the truth that God is not responsible for the death of man. Death, one of the consequences of sin, is the work of the devil. Christians are bound by charity after the example of Christ to share with one another the blessings either material or spiritual which they have received from God’s immense love and mercy. LỜI CHÚC MỪNG "NGÀY CỦA CHA"